Holocaust Controversies: "Thereafter Kube had shown the Italians a gas chamber in which the killing of the Jews was allegedly carried out." "Thereafter Kube had shown the Italians a gas chamber in which the killing of the Jews was allegedly carried out." 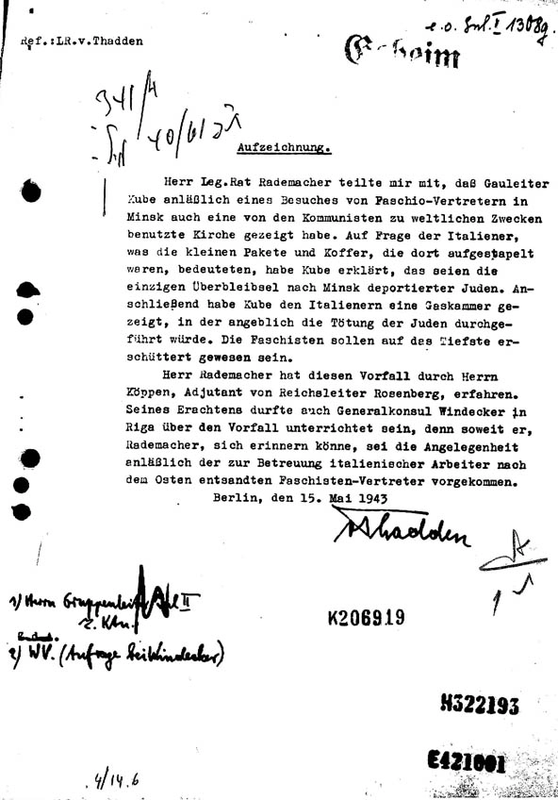 The German Foreign Office document below was an exhibit T/341 in the Eichmann trial. It is also cited in Nationalsozialistische Massentötungen durch Giftgas. Eine Dokumentation (S.92). The author of the note is Eberhard von Thadden, who became an expert on Jewish affairs in the Foreign Office in April 1943. Franz Rademacher was his predecessor and is a well-known figure in the history of the "Final Solution". Werner Koeppen was Alfred Rosenberg's adjutant and his permanent representative to Hitler. Wilhelm Kube was the infamous Gauleiter of Belorussia. Mr. Legation Counselor Rademacher informed me that on occasion of a visit by Fascist representatives in Minsk Gauleiter Kube had also shown a church that had been used by the Communists for worldly purposes. Asked by the Italians what the little parcels and suitcases piled up there meant, Kube had explained that these were the only leftovers of Jews deported to Minsk. Thereafter Kube had shown the Italians a gas chamber in which the killing of the Jews was allegedly carried out. Supposedly, the Fascists had been most deeply shocked. Mr. Rademacher learned of this incident through Mr. Koeppen, adjutant of Reichsleiter Rosenberg. In his opinion General Consul Windecker in Riga is likely to also be informed about this incident, for as far as he, Rademacher, could remember, the incident had occurred on occasion of the Fascist representatives sent east to take care of Italian workers. Herr Leg.Rat Rademacher teilte mir mit, dass Gauleiter Kube anlaesslich eines Besuches von Faschio-Vertretern in Minsk auch eine von den Kommunisten zu weltlichen Zwecken benutzte Kirche gezeigt habe. Auf Frage der Italiener, was die kleinen Pakete und Koffer, die dort aufgestapelt waren, bedeuteten, habe Kube erklaert, das seien die einzigen Ueberbleibsel nach Minsk deportierter Juden. Anschliessend habe Kube den Italienern eine Gaskammer gezeigt, in der angeblich die Toetung der Juden durchgefuehrt wuerde. Die Fascisten sollen auf des Tiefste erschuettert gewesen sein. Herr Rademacher hat diesen Vorfall durch Herrn Koeppen, Adjutant von Reichsleiter Rosenberg, erfahren. Seines Erachtens durfte auch Generalkonsul Windecker in Riga ueber den Vorfall unterrichtet sein, denn soweit er, Rademacher, sich erinnern koenne, sei die Angelegenheit anlaesslich der zur Betreuung italienischer Arbeiter nach dem Osten entsandten Faschisten-Vertreter vorgekommen. There were no stationary gas chambers in Minsk, therefore a mobile gas chamber is meant, i.e. a gas van. Gas vans were used in Maly Trostenets extermination camp not far from Minsk. Deniers will dismiss this on a mere technicality - as hearsay. This attempt cannot be taken seriously, of course. All the mentioned people were high-ranking Nazis, most of them dealing with the "Final Solution" one way or another. This is hearsay, but no link in this hearsay chain had a reason to introduce the mention of a gas chamber if it wasn't true. They may have had reasons to distort Kube's actions, etc. (in-group struggles and all that) - but not to invent the very method of murder. This secret German wartime note is a legitimate piece of evidence for Nazi gassings of Jews.